Precision Fab Products, Inc. 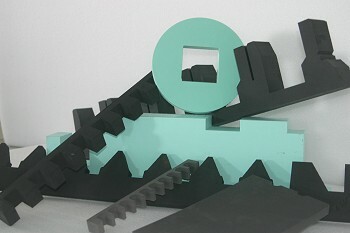 Foam Manufactured Products ..:: MATERIALS ::.. It is all about Choices! Foam is one of the most versatile materials ever created. Two foams may look alike, but they may feel and perform entirely different. So how do you choose the proper foam material for your application? It can be challenging - not only do different foams have different cell structures and characteristics, but the foams from the same material family can be greatly different due to density and firmness specs. The choices and options are seemingly endless. Thankfully, the properties of foam can be identified and specified very precisely. By doing this, it is possible to identify the right foam for the right application. It is also why partnering with a quality foam fabricator is crucial. We can help you choose the best material that fits your requirements. 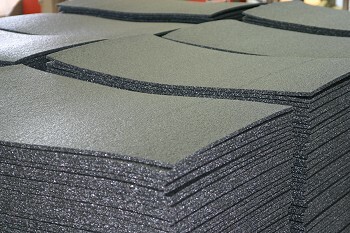 Cross-linked polyethylene (XLPE): Has superior longevity and is a high density closed cell foam with a compact feel. Cross-linked PE has many same properties of PE but it also the ability to protect class “A” surfaces (used extensively in packaging of medical products and equipment). Crosslink foam is designed for durability and reusability, making it ideal for heavy duty storage and shipping applications. Polyurethane foams (PU): Is a resilient, remarkable versatile material due to its many available densities and colors. It has a low tooling cost and is economical for package protections. It is often used for case/tray inserts, packaging, box liners, cushions, and static sensitive products. Polyurethane is also ideal for sensitive drop requirements which makes it very popular for seating, flooring and bedding. Its properties also lends itself to be used in protecting lighter weight, delicate objects. It has high abrasion resistance, and excellent resistance to oils, solvents, fats, greases and gasoline. It does have a higher load-bearing capacity than any conventional rubber. Polyurethane has outstanding resistance to oxygen, ozone, sunlight and general weather conditions. Polyethylene (PE): Is a closed cell foam available in a wide range of densities that is highly durable and flexible. Its typical fabrication methods include saw cut, die cut, and water jet cut. Polyethylene is reusable, lightweight, and non- abrasive. It combines moisture resistance with good memory characteristics. Therefore, it is ideal for protective packaging. 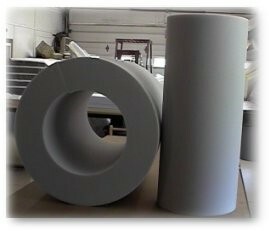 Polyethylene also has excellent vibration/impact/shock absorption and insulating properties and is resistant to chemicals, grease, mold and moisture. Lastly, it is tear/puncture-resistance, lightweight, non-dusting and has thermal conductivity and dimensional stability through its uniform cell structure. Polypropylene (PPE): Is a strong, heat-resistant, low-density, light-weight closed-cell foam. It is well suited for shock and energy absorption or vibration dampening and so it is used widely in packaging, material transport and automotive applications. It does have a lower impact strength compared to high density polyethylene, but it has superior working temperature and tensile strength. It also has excellent resistance to organic solvents, degreasing agents and electrolytic attack. It is resistant to staining and stress cracking, has a low moisture absorption rate, and retains stiffness and flex. It provides for effective insulation and breathability, and buoyancy.